Behind all your stories is your mother’s story, because hers is where yours begins. 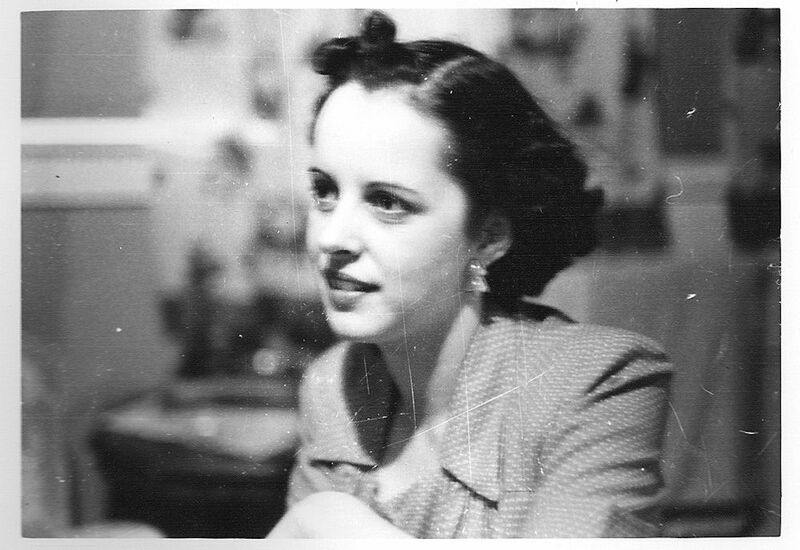 My beautiful mother Joan at age 25. I always thought my mother was the most beautiful woman in the world. I knew she was. She didn’t look or talk or act like any of my friends’ mothers. She was exotic with her dark eyes and British accent. The way she ran the household would put June Clever to shame. No, mom didn’t iron in pearls but the house was European tidy and organized. She always made sure that she looked lovely when dad came home. Dinner was always on the table and there was always, always dessert. Yummmm. She had a spine of steel and a devil-may-care attitude. I guess that after enduring bombs dropping on your neighborhood for several years, everything else is a trifle. She was quick to laugh. Not afraid to shed some tears. Ready to cuddle an upset child with warmth and soft there there nows. A sweet little kiss from me to you. Yes, we had our disagreements as any mother and daughter will. She was never afraid to voice her opinion but was also willing to overlook some of my ignorant decisions, too. Oh, well, I got smarter. Maybe we both did. Even in her final days of illness she was able to find a joke to make us both laugh. Boy, what dignity! What an example. I miss my mom and wish she could see what what I’m doing these days. I can only hope to pass along some of her values to my children and grandchildren. I think she’d be pleased. 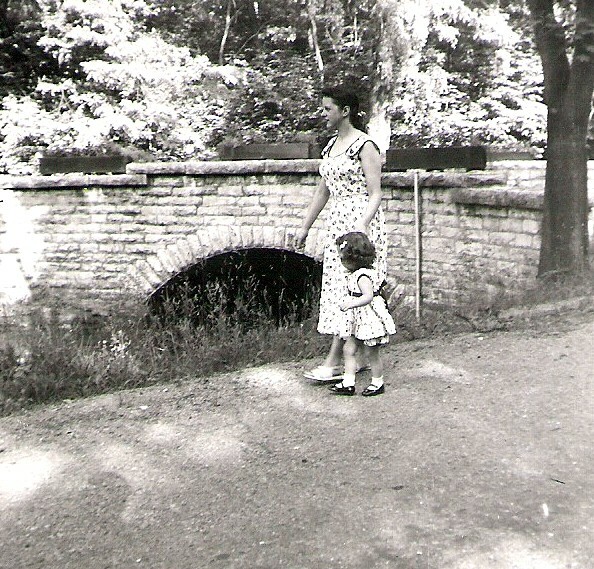 Taking a walk with my mother in the park. 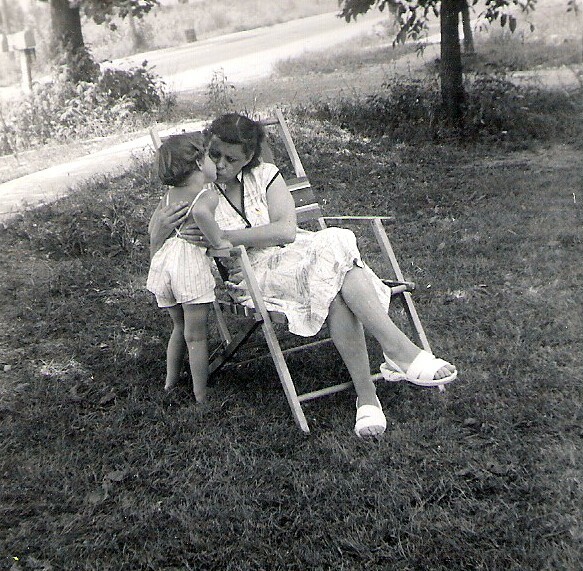 No one worries about you like your mother, and when she is gone, the world seems unsafe, things that happen unwieldy. You cannot turn to her anymore, and it changes your life forever. There is no one on earth who knew you from the day you were born; who knew why you cried, or when you’d had enough food; who knew exactly what to say when you were hurting; and who encouraged you to grow a good heart. When that layer goes, whatever is left of your childhood goes with her. I have only been into retirement about three weeks but, frankly, I have been sooooo busy! I know, all retirees say that. But it’s true. It rained nearly the entire first week with some epic flooding in this area. I spent much of that week just organizing the stuff I brought home from my office (too much after 17 years). And making lists. I’m a list maker and have always been one. Just love checking off those items. After awhile, however, I reminded myself that I didn’t want my entire retirement to be one big To Do list. I want to have some fun! So I signed up for the Quick Draw and Plein Air Painting event sponsored by Jasper Community Arts. I have never been able to participate before since I am an employee so I was grateful for the opportunity this year. It is also co-sponsored by another organization I belong to, RunawayArtists.com. This two-day event was on the Friday and Saturday before Mother’s Day. Friday predictions were for more rain so I tried to think of somewhere sheltered to paint. 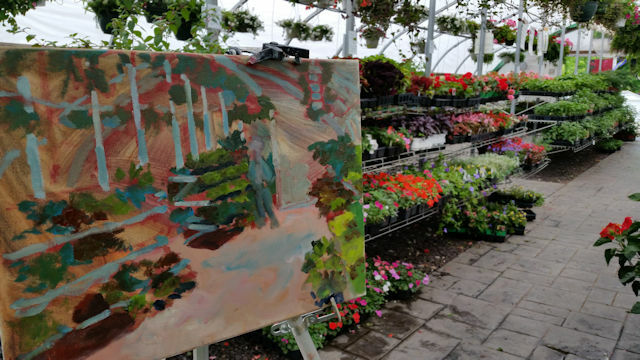 I asked my friends at Green Thumb Nursery if they would mind if I painted there and they were delighted so that is where I began. 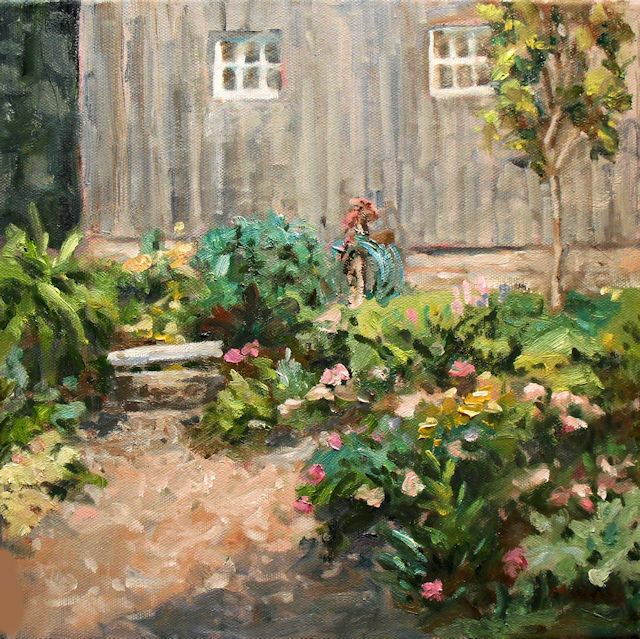 It was a very pleasant morning with the rain pattering on the roof and painting among all the flowers. The most difficult part was to find the right corner where I wouldn’t be in the way of all the Mother’s Day shoppers. The angle wasn’t the most desirable as I couldn’t back up enough to gauge the proper perspective, but a lovely morning, all in all. 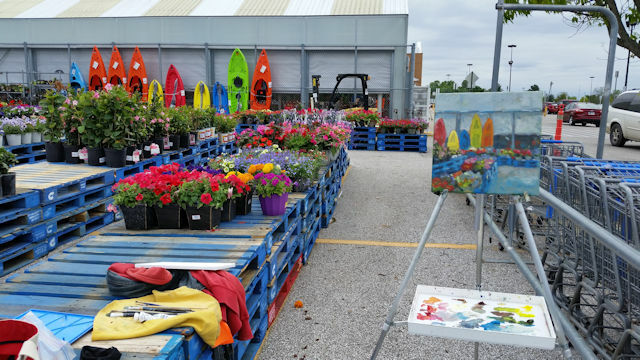 Watching all the shoppers come in for holiday, I thought that I might stick with the flowers theme and went to the other side of town to paint in the Walmart garden center. It was an awesome display of flowers! Again, I found an out of the way spot to paint. 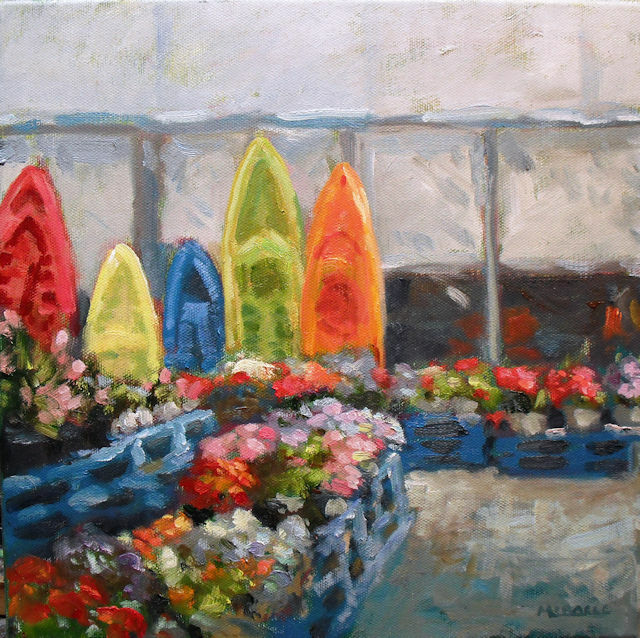 I was particularly enamored with the bright colors of the kayaks propped against the building contrasting with all the flowers. You have to develop a pretty thick skin to paint in such a public and well-trafficked space but it didn’t bother me at all. No one from the store came up and asked what I was doing but I did have a few customers asked if I worked there. It must have been my painting apron. Ha ha. Finally, at the end of the afternoon, I participated in the Quick Draw event at the Schaeffer Barn in downtown Jasper. This old log barn was moved here and restored and has a beautiful garden space. Always something interesting to paint. This is a timed event and the artists only have two hours to complete a painting. I came in third. Yay! 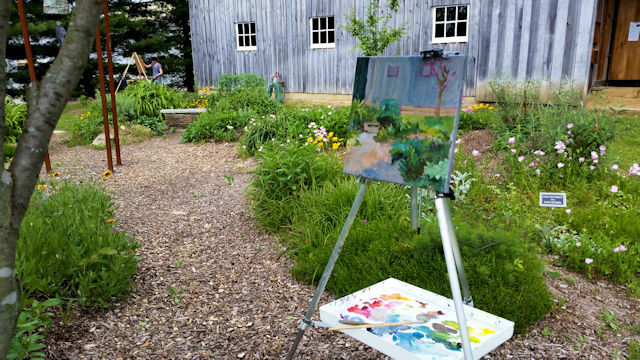 Painting at the Schaeffer Barn, Quick Draw event. Schaeffer Barn Quick Draw event. Oil on canvas, 12 x 12. Kit Miracle Third place winner! The second day of the event I worked in the morning as a volunteer. 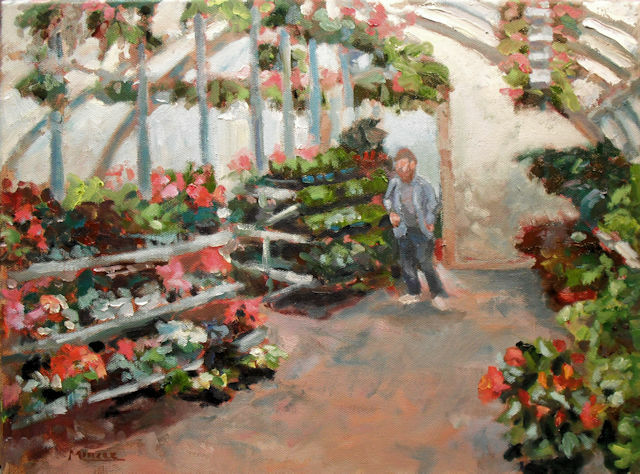 Later in the day I did some more plein air painting at a different garden center but nothing came of it. Sometimes it works that way. I must have used all my creative juices the day before. But that is alright. I met some very nice artists and had a good time in the fresh air.